Thich Nhat Hanh is someone that many people look to for advice. He is a zen master and wise beyond his years, he offers advice to those in need of it and each word he speaks is something that should be taken to heart. 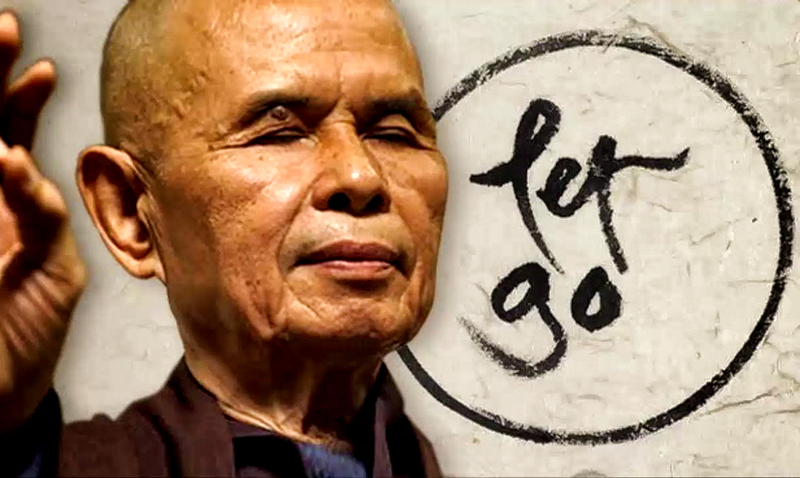 When it comes to letting go, we all struggle but Thich Nhat Hanh is well aware of how to reduce the attachments we have to the things we cling to the most. While his explanation is simple, it is not anywhere near as easy as you might expect it to be. In ‘Answers from the Heart’ Thich Nhat Hanh explained letting go as follows and it is something that I feel everyone should read at least once in their lives. This will come in handy when you’re having a hard time and really help you get to where you need to be. “To “let go” means to let go of something. That something may be an object of our mind, something we’ve created, like an idea, feeling, desire, or belief. Getting stuck on that idea could bring a lot of unhappiness and anxiety. We’d like to let it go, but how? It’s not enough just to want to let it go, we have to recognize it first as being something real. We have to look deeply into its nature and where it has come from, because ideas are born from feelings, emotions, and past experiences, from things we’ve seen and heard. With the energy of mindfulness and concentration, we can look deeply and discover the roots of the idea, the feeling, the emotion, the desire. Mindfulness and concentration bring about insight, and insight can help us release the object in our mind. Say you have a notion of happiness, an idea about what will make you happy. That idea has its roots in you and your environment. The idea tells you what conditions you need in order to be happy. You’ve entertained the idea for ten or twenty years, and now you realize that your idea of happiness is making you suffer. There may be an element of delusion, anger, or craving in it. On the other hand, you know that you have other kinds of experiences: moments of joy, release, or true love. You recognize these as moments of real happiness. When you have had a moment of real happiness, it becomes easier to release the objects of your craving, because you are developing the insight that these objects will not make you happy. This really puts things into perspective in quite possibly the best way imaginable. Referring to letting go as an art form is something that should resonate with us all. While each and every one of us will interpret this in our own way, I am sure it is clear just how important it is to work through the things that we need to work through in order to be able to let go. Gaining strength and growing properly will bring forth far more than you could ever imagine. We must be willing to explore our emotions and work to see as well as experience the present moment. Thich Nhat Hanh has said time and time again that through meditation letting go is much easier and I believe that is very true. The more we ease our bodies and minds, the quicker things become as they should be. To hear Thich Nhat Hanh speak on this topic please feel free to check out the video below. Whether you’re a spiritual person or not there is a lot for you to gain from his words. Looking deeper is something that can and will help you achieve far more than you are currently aware of.